Please click here to go to our RESTORATION PAGE. Over the last few decades, much has been learned about the preservation of historic headstones. Preservationists have used ancient techniques and modern science to preserve memorial monuments. Whether a small grave marker or large mausoleum, the stone of choice was generally the same type of stone used as that used for historic buildings. These stone types were Marble; brownstone slate and some granite types. Consequently, the same treatment and headstone cleaning methods used in tombstone preservation are almost identical to the preservation techniques used in ancient stone buildings. Therefor churchyards lend an ideal opportunity for preservationists to test and evaluate different treatments on a large selection of rock types used for marking graves. Through the results of these cemetery experiments, conservationist can use this knowledge to help them choose the best-suited materials and cleaning methods for historic buildings. Cemetery grave markers exist in some extremely harsh environments. Gravestones are in contact with the ground and are relatively unprotected from all kinds of weather conditions. In these unforgiving landscapes, the monuments will be subject to all kinds of weathering effects. Stone erosion will be accelerated in comparison to the same types of memorials in a more forgiving environment. A headstone exposed to this deterioration phenomenon will reveal the following types of problems. Soiling and stained headstones, disaggregation of stone, spalling, cracking of monuments, displacement, and flaking. As if these natural effects were not enough for our loved one’s tribute, other factors contribute also. Vandalism such as graffiti toppled or broken and even damaged caused to the memorial by failed attempts to repair the problems with incorrect stone fixing techniques or unsuitable material used to treat/clean or fix the gravestone. Weathering forms that affect monuments. Normally, different memorials stone types will exhibit distinctive types of weathering. Weathering effects can be linked back the type of environments the stone is placed in. Marble and brownstone suffer from discoloration and biological growth more than granite and slate owing to the greater porosity and greater capacity for water retention. Marble tombstones will lose details from erosion faster than granite. On the coastal region of Canada in Victoria B.C, Ross Bay Cemetery has some prime examples of these weathering effects. Due to Ross Bay Cemeteries location, it is a great example of marble erosion. Ocean storms and sea salt will speed up weathering effects. Like many other old resting places, Ross Bays oldest headstones are made mostly from marble. The white marble was partially sought after; it was soft and ideal for hand carving. Unlike granite, the memorials made from marble are often faded into obscurity. This was mainly due to marbles inability to resist acids like acid rain which is more of a factor in the ever-growing industrial economy. The problems associated in marble headstones are less so with granite. Granite is a very hard material and easier to maintain in a cemetery. Although there are many different types of granite, the majority of granite used in monuments are darker colors. The darker colors granites are primarily made of (35%) quartz and (45%) feldspar and potassium. These materials are harder materials Compared to marbles dolomite, magnesium and calcite. Thus using granite as a modern way of memorializing our loved ones has become the custom with monument manufacturers throughout the world. To refurbish monuments, meadowlark memorials use biological growth remover and growth inhibitor. Nontoxic and long-lasting. We want to preserve our history. If not done correctly, headstone refurbishments can cause more damage than good. Acids and bleaches can stain, hone or erode the surface with detrimental results. Sometimes these results are not obvious, but over time, inscriptions will become less legible and one day unreadable. 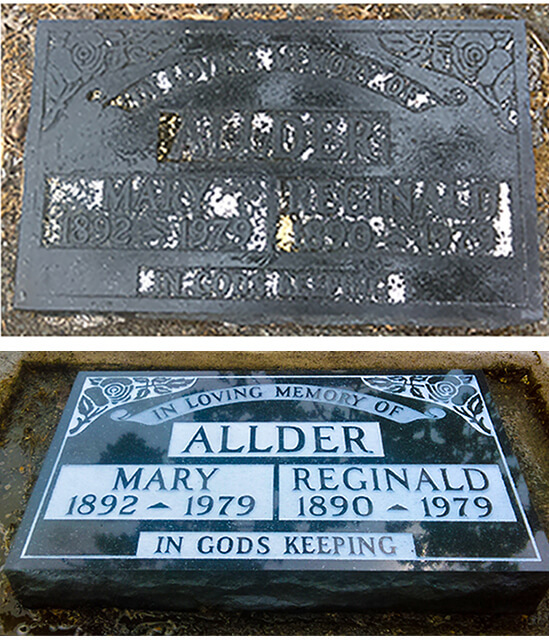 Why clean and refurbish memorials? The usual driving force to clean Gravestones. The main reason is to read the otherwise obscured inscriptions. Another reason may be to bring back the natural beauty of the memorial. If the stone looks old and covered in growth, then the memorial or statue should be cleaned. What type of stone is the memorial? Once you have determined what type of stone the memorial is, you can then choose the right method to clean and refurbish the memorial. Older Gravestones are likely to be Marble, sandstone, limestone, slate and newer one’s granite.